Has your dog exhibited any of these signs? Difficulty rising in the morning? Less enthusiastic about going for a walk or playing? Inability to jump on the couch, the bed or into the car? Reluctance to climb the stairs? Whining or growling when being touched on the legs or back? 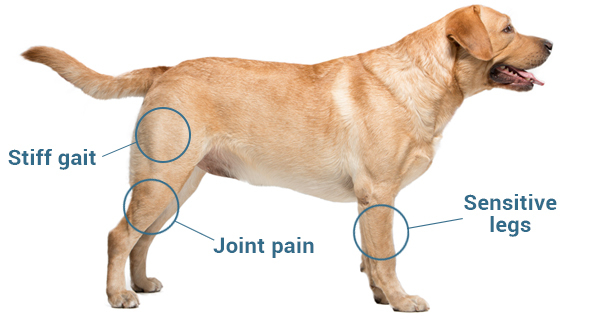 If the answer is yes, then these may be signs of canine osteoarthritis and joint degradation. Canine osteoarthritis is a chronic joint inflammation caused by the deterioration of joint cartilage. It is a progressive and degenerative disease that can affect dogs of any size and any age. However, large breed dogs, very active dogs such as agility dogs, hunting or working dogs, and obese dogs are more likely to develop osteoarthritis than the general population. Most of the time, canine osteoarthritis develops when the aging organism loses the ability to replace the cartilage lost during the normal wear and tear process. Loss of cartilage creates inflammation, which leads to pain and visible clinical signs. In younger animals, canine osteoarthritis can result from a traumatic event affecting the joint, from abnormal wear and tear, or from genetic issues such as Canine Hip Dysplasia. Dogs with certain metabolic or infectious diseases, such as diabetes or tick-borne diseases, and obese dogs may be at a higher risk for osteoarthritis. If you believe your dog may be suffering from osteoarthritis, consult with your veterinarian. Your veterinarian will perform an assessment of historical symptoms and a physical examination. The stage and severity of your pet’s osteoarthritis may be factors in the treatment and management plan your veterinarian recommends. Learn more about the treatment and management of canine osteoarthritis.